Edward III was born in Windsor Castle on 13 November 1312, the first son of Edward II and Isabella of France. He became King on the formal deposition of his father on 25 January 1327. He ruled for the next 50 years. Tall and handsome, with strawberry blond hair, Edward was a well-liked and popular ruler. He excelled in all things knightly, with a particular fondness for hunting and falconry. With an affection for the stories of King Arthur, his chief aim during his rule was to unite the noble families through ties of loyalty, generosity and chivalry. 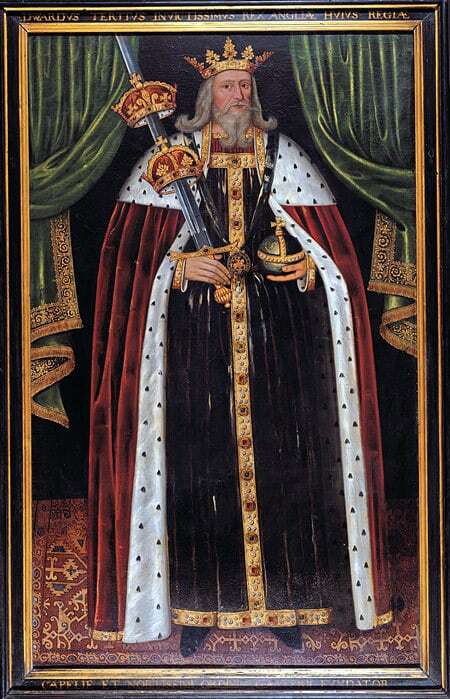 This portrait shows Edward as an old man, holding the orb of state, and carrying his 6 foot sword, piercing the crowns of Scotland and France. The painting represents the King standing on a Turkish carpet, wearing a dark blue, jewelled robe with ermine-lined crimson mantle. In addition, he wears the George suspended from a blue ribbon, the insignia of his great establishment, the Order of the Garter. Around the border are the words “Edwardus Tertius Invictissimus Rex Angliae Huius Regiae Capelie Et Nobilissimi Ordinis Garterii Fundator”. It shows the King with the dominant emblems of his reign – the establishment of the Order of the Garter, and the Hundred Years War with France. It is unlikely to be a true likeness, since it does not date from the time of Edward III, but what is its history? 3 days later, on the 27th May, an entry records that a curtain was made by Daye and Berdill to hang over the painting, at a cost of 17s 8d. This gives a rough date, and a potential artist, “Mr Baker”, although as the Chapter Clerk at the time was Gregory Baker, it could imply that he was claiming back a payment made. The Dean at the time was Anthony Maxey, installed in 1612, and it is nice to think that perhaps he commissioned the portrait to celebrate his becoming Dean and Register of the Order, and to commemorate 300 years since Edward III’s birth. The next reference to the painting is in May 1672, when the Chapter Acts record that the Treasurer is to arrange that “a new frame be made equall to the former for the picture of the Founder, hanging in the Chapter house”. There is then no further mention of it until 1957, when Patrick Manley offered to clean and repair the portrait as thanksgiving for his daughter’s birth. Guidebooks to the Chapel of the early 1900s show that it was still displayed in the Chapter House, the present day Vestry. At some point in the 20th century it was moved to the South Quire Aisle where it can be seen today, a visual reminder of the man responsible for the establishment of the College of St George and the Order of the Garter.